Property prices are skyrocketing along HCM City's proposed metro lines. "Someone asks to buy land and houses in this area every day," Cuc, a resident of Quarter 6, Truong Tho Ward, Thu Duc District, said. "It is too late since even if there are any available, the price has doubled." Cuc's own house is situated 10 metres from Binh Thai, which will be station number 10 on route No 1. Her neighbour had sold their house for VND3.2 billion (US$142,860) though it has no deed for the building or land use, she said. Another neighbour has a 60sq.m house which was priced at VND300 million a few years ago. Now people are offering VND1 billion, but the owner refuses to sell. Other people living in the ward said several houses are on offer at VND30 million ($1,339) a square metre since the location next to the station is convenient for doing business. Prices on Linh Trung Street, a few hundred metres from Thu Duc station, have also soared. A 355sq.m house with papers has been advertised for sale at VND18 million a square metre. According to Tuoi tre (Youth) newspaper, there are around 45,000 units in a series of apartment projects along the eight planned metro lines. Along line No 1 (Ben Thanh – Suoi Tien), around 6,000 units are under construction and likely to be handed over in the next two to three years. 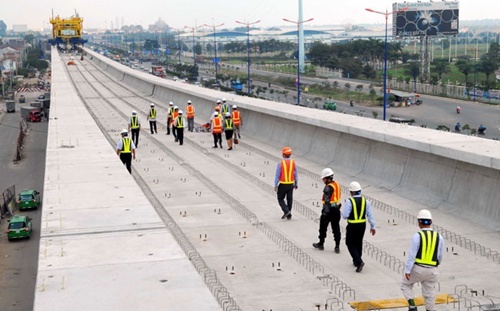 The line, work on which began in August 2012, will run for 19.7 kilometres, including 2.6km below ground, through districts 1, Binh Thanh, 2, 9, and Thu Duc, and Di An town in Binh Duong Province. It will have 14 stations, three of them (Ben Thanh, Opera House, and Ba Son) underground. Kieu Diem, who lives in Thao Dien Ward in District 2 and sells apartments part-time, said at least 15 projects are under construction between her house and station No 7. Jun Mizutani, a Japanese investor, said through a partner in Viet Nam he kept an eye on several projects along metro routes, and is amazed at their speed of development. "The real estate market in HCM City is like it was in Japan 30 years ago." Prices of new apartments around the terminus of the first line at Ben Thanh Market have been increased to US$5,000-7,000 per square metre. Ngo Quang Phuc, general director of Him Lam Real Estate Trading JSC, said developments along metro routes would be the trend in future. "We are using our lands where metro line No 1 passes through to build 1,000 apartments, which we will be launching this year." Thao Dien Pearl's 450 apartments and Masteri Thao Dien's 3,000, respectively near station Nos 6 and 7 have been sold out. In mid-2015 Thanh Yen Land began selling 125 apartments at Depot Metro Tower built by Minh Nguyen Long Co. in Thu Duc. The project, located near station No 12, has been selling well. Hung Thinh Corp. is selling Lavita Garden in Thu Duc District near station No 10, National Housing Organization Joint Stock Company has launched First Home Premium Truong Thi near station No 9, Hong Kong Land and Son Kim Land launched Nassim Thao Dien near station No 7, and Vingroup has Vinhomes Central Park near station No 5 among others. Along metro line No 2 (Ben Thanh – Tham Luong), three projects — Rich Star, Depot Metro Tower, and Southern Dragon — were unveiled last quarter. Hung Loc Phat Company also plans the Silver Star project 100 metres from line No 4 (Nguyen Van Linh Parkway – Ben Cat Bridge). Also along this route, Kien A is preparing to launch its premium villa project Galleria, while Sunrise Riverview, Florita, Dragon Park, and others are being sold. In the last 12 months around 20 medium- and high-priced projects have been launched along line Nos 3A, 5, and 6.